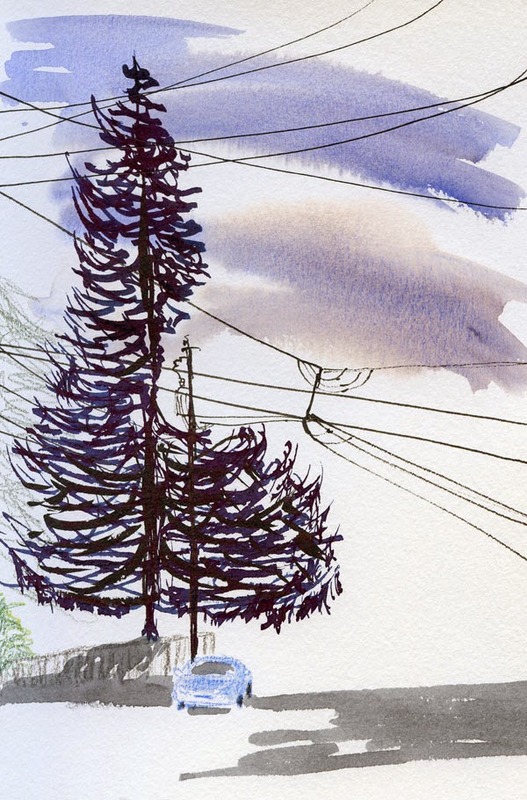 When I first started this series of power line sketches, it was my way of paying respect to these old, once-dignified trees. 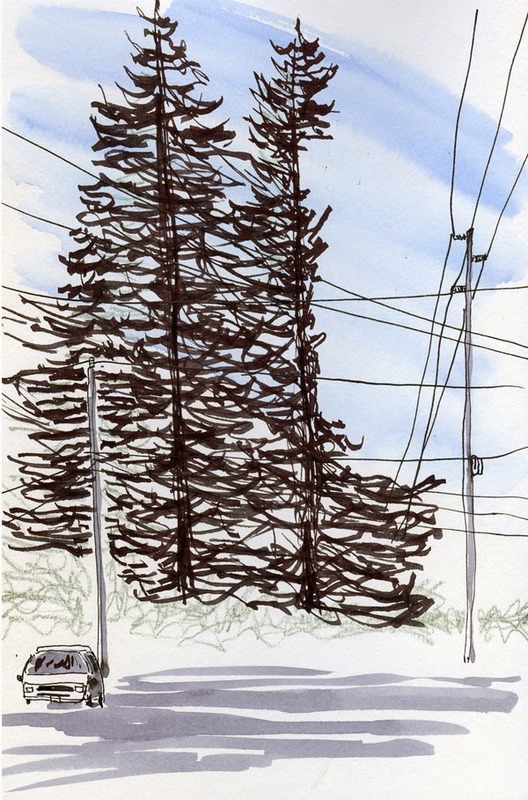 The power lines were merely the context and reason for the merciless butchering the trees had received. 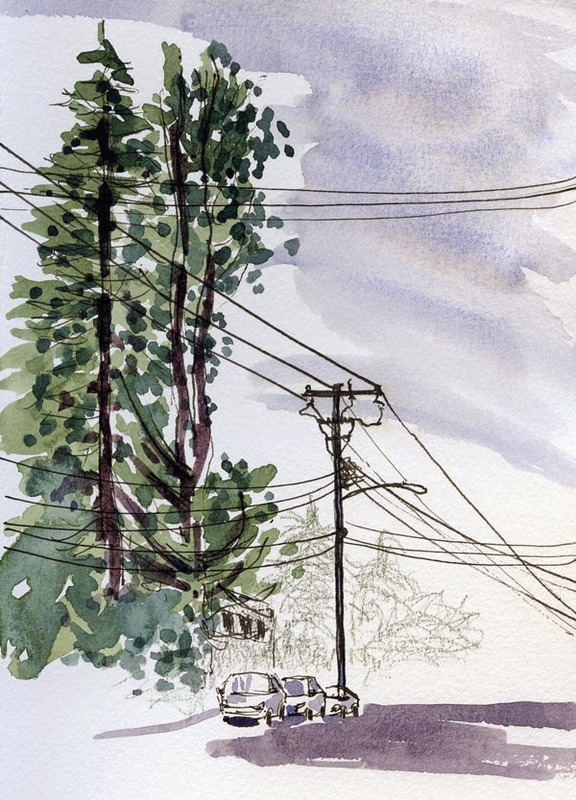 The more sketches I do, however, the more interested I’ve become in the utility wiring itself. I used to think it all looked the same, but in different neighborhoods, the way it’s attached to the poles varies. With all the added types of utilities over the years – fiber optics are the most recent addition, coming in fast and furious in our neck of the woods – the wiring has become more and more complicated. The poles and lines are as ugly as the trees are (or might have been) beautiful, yet they still hold my fascination in a perverse kind of way. 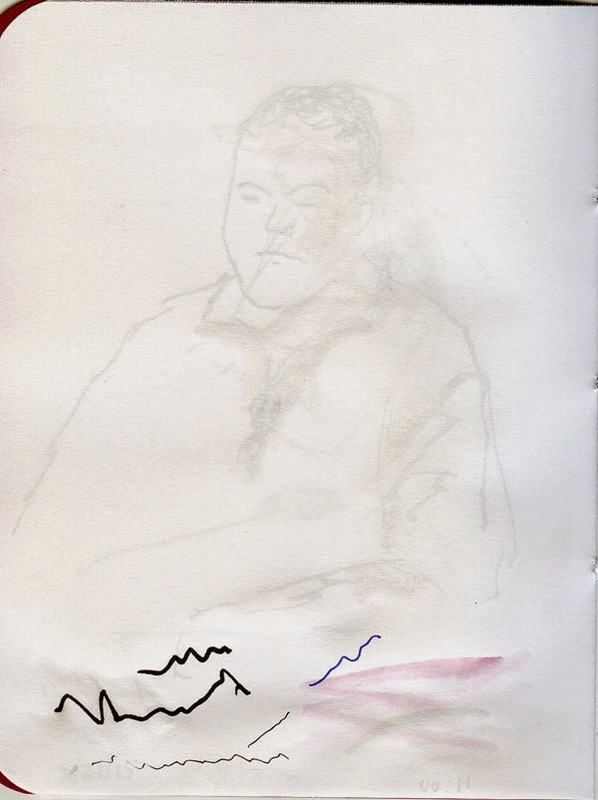 Stillman & Birn Alpha sketchbook (Sketched from photo. 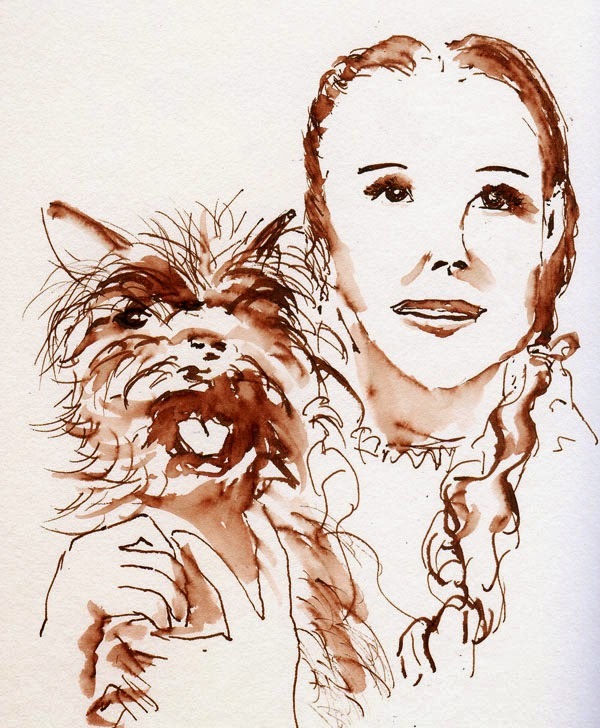 Glinda confirms that she is right, and then with a tap-tap-tap of her ruby slippers, Dorothy takes herself back to black-and-white Kansas. My old faithful Sailor fude – the one I found myself comparing to all other pens I tried and reviewed – has been in my backyard (and in my bag) for the Epic’s duration, patiently waiting for me to return. Indeed, I often reached for it when another pen I was experimenting with frustrated me. Has it been my grail all along? 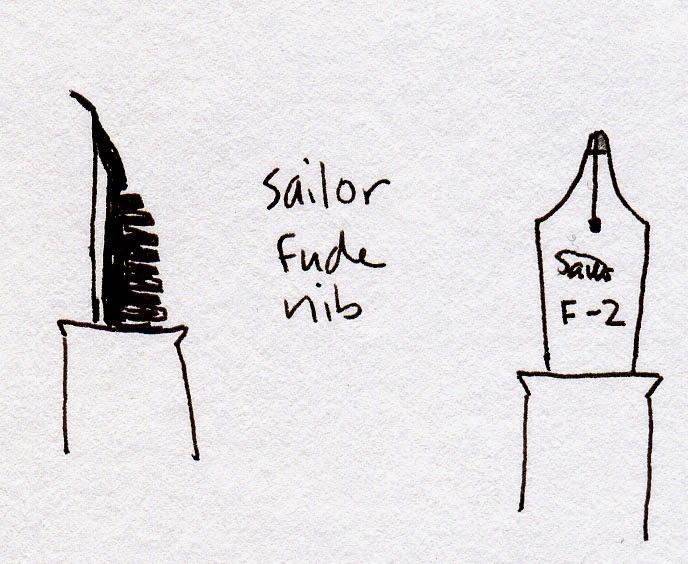 If I just splurge on the 21kt gold version – the “mother of all fude nibs” that I’ve been lusting after for months – will that take care of my yearning (not to mention the posting issue)? An essential difference between the gold version and the inexpensive stainless steel one is that the latter is bent at a sharp angle, while the gold one I tested at the L.A.Pen Show is gradually curved, which enables beautiful transitions in line width. It seems to be everything I love about my old fude – but better. Mostly. My only disappointment in its performance was that it seemed scratchier than I would have expected. Could that scratchiness be polished away with some judicious fine-tuning by Nibs.com’s John Mottishaw, who inspects, tests and optimizes every pen (to the customer’s requests) before shipping it? 1. The “grail” doesn’t have to be one single pen. I obviously had it in my head that finding one perfect pen was the ideal. But I’ve come to accept that it’s OK to favor more than one variable-line-width nib, using each to do what it does best. For example, based on the pens I’ve reviewed in this series, a combination of the Sailor fude plus either the Platinum music nib or the Franklin-Christoph music nib might be a grail pairing – the fude taking care of the thin-to-thicker range and the music nib taking care of the mid-to-thickest range. 2. I used to think that a wide-ranging flexible nib would be the perfect sketching pen, responding to the hand’s intuitive changes of pressure to regulate the line width. In some hands, that must be true, but not in mine. 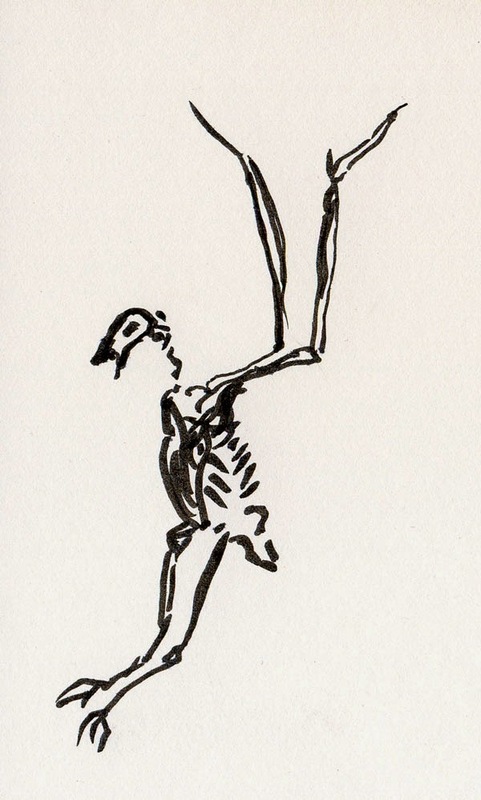 As much as I love the Pilot Falcon nib’s flexiness, sketching with a flex doesn’t come intuitively to me. Strange as it seems, tilting the angle or direction of the nib (as is done with almost all the other nibs I tried) feels more intuitive and responsive. Writing samples made with Sailor fude nib. 3. More than almost any other sketching tool or material, fountain pen nib preferences are highly personal and idiosyncratic. I knew this before my Epic began, but my belief was reinforced by my research. Although I can usually count on others’ evaluations about the general quality of a pen, how it behaves in my hand while sketching is all about me. An urban sketcher whose work I admire, Teoh Yi Chie (better known online as Parka), recently compared nine pens, all with fude nibs, in an interesting and informative video. I’ve tried nearly all of those same nibs, and my conclusions were exactly the opposite. 4. Let’s face it: I love fountain pens. Obviously, I’m very picky about what I sketch with, but I’m far less discriminating about what I write with. Other than the ones from eBay that I trashed, I’ll probably keep all the pens I tested, because even though none turned out to be the grail for sketching, every one is a delight for writing. 5. I found that the looser, more confident and more expressive I allow my sketching line to be, the more a variable-line-width pen can do for me. If I am unsure, tightly clutching my pen and trying to draw with small, tentative marks, no type of pen nib will turn those marks into flowing, confident lines. On the other hand, if I put the pen to the page and draw as if I know what I’m doing, almost any pen will produce a more beautiful line. 6. Perhaps the most delightful lesson learned was confirming how much I enjoy using the line as a sketching element. All the sketches I produced to experiment with various pens taught me this. 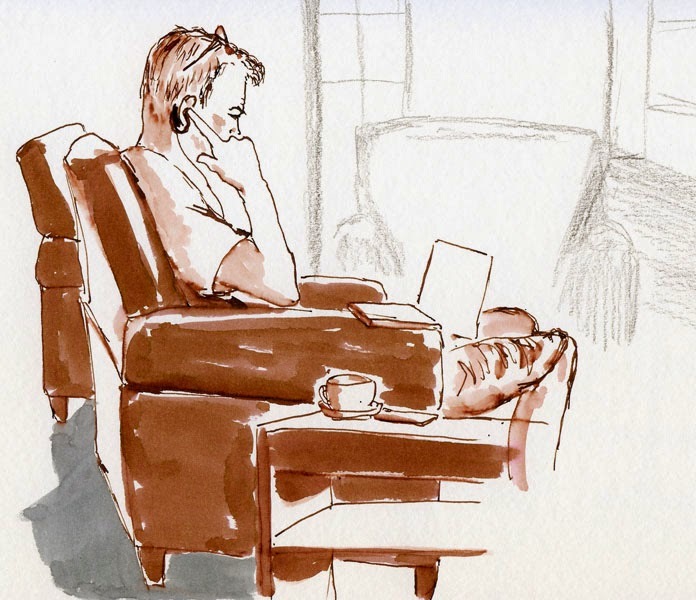 Early in my urban sketching life, I saw the pen line as nothing more than a coloring-book outline that would be immediately filled in with watercolor. Fairly quickly I realized that color can’t compensate for a weak drawing, so I started focusing on making better renderings. 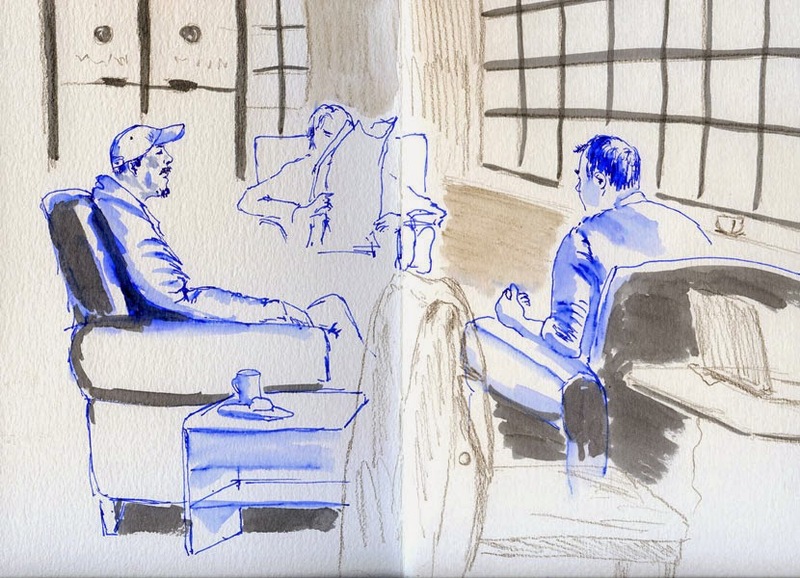 Eventually I learned that a strong sketch incorporates many other important elements – composition, value, shape – and my goal is to put all of them into practice simultaneously with each sketch. But through it all, I’ve come to a greater appreciation for the line on its own – and the potential expressiveness of variable-line-width nibs is what has brought me here. It’s a good place to end my Epic Search and Discovery. Thanks for coming along! My trusty Sailor fude nib pens. . . there's no place like home! Jinhao 599A “Safari” calligraphy fountain pen: This pen, purchased for about $5 on eBay (including shipping from China), is probably the single-most worthless fountain pen I’ve owned. (The bold and shameless pirating being displayed in the product’s name doesn’t surprise me.) Ironically, its bent, fude-like nib isn’t half bad. 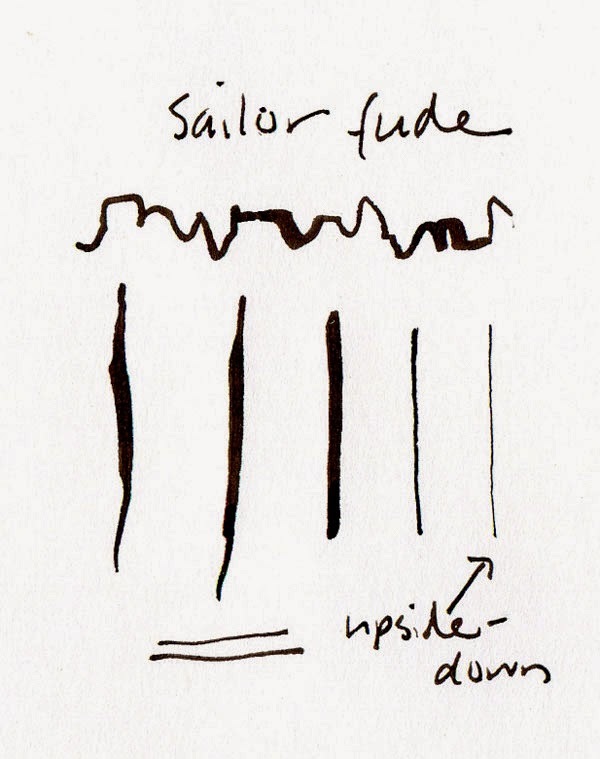 It doesn’t have the same range of line variation as my Sailor fude, of course, but it’s smooth and has a decent flow. The immediate deal-breaker is that the body and section won’t stay screwed together! I’ll write a couple of words or scribbles, and the pen continually unscrews itself. Into the trash it goes. Lanbitou calligraphy nib fountain pen: Purchased on eBay for about $7 (including shipping from China), this pen was one I learned about from someone in the Seattle Pen Club who also has an interest in variable-line-width nibs for writing western calligraphy. Like the previously mentioned Jinhao “Safari,” the Lanbitou has a decent fude-like nib. In fact, I’d say it’s comparable to the Sailor fude in terms of line variation. The body isn’t bad, either (for seven bucks). However, it sometimes goes dry after only a day or two of idle time, and it displays (sometimes profuse) leakage every time I open it. Another one for the trash. I don’t like to make sweeping generalizations such as “you get what you pay for” and evaluate fountain pens by price. After all, the Pilot Petit1 and Platinum Preppy, which can be purchased for about $3 to $4 each, are stellar examples of amazingly high quality pens for the price. But in the case of those Chinese pens, $5 is overpriced: You get even less than what you paid for. Zebra Comic G nib: Putting the Franklin-Christoph music nib on a Jinhao X450 pen body was my first foray into making Frankenpens. My second was going to be putting a Zebra Comic G nib on the same Jinhao. The Zebra G is a flexible nib designed for dip pens that people are putting onto the Jinhao – creating a fountain pen with dip pen flexibility! 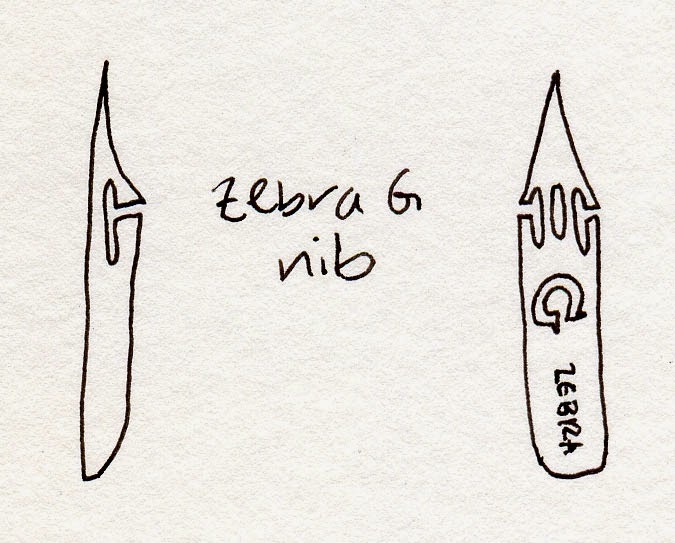 A quick search on Amazon showed that the price of the Zebra G nibs is 10 for $10. 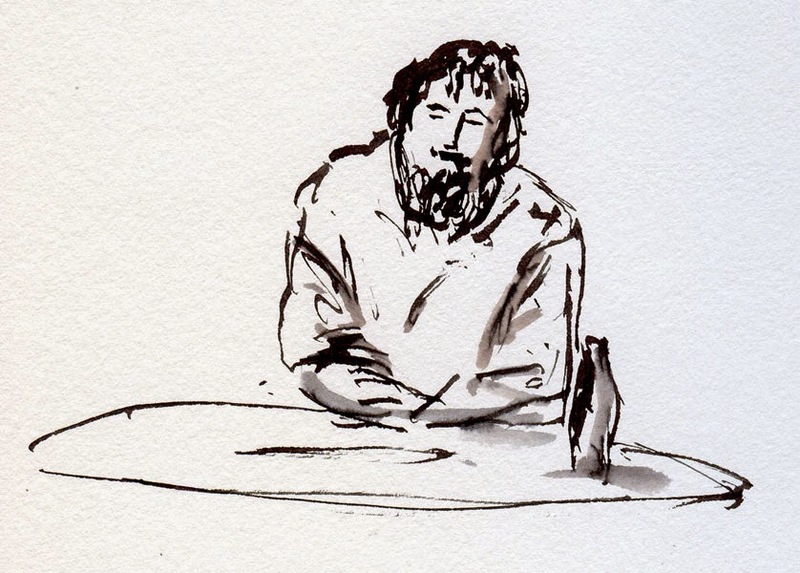 Let’s see – five bucks for the Jinhao and another buck for the nib. 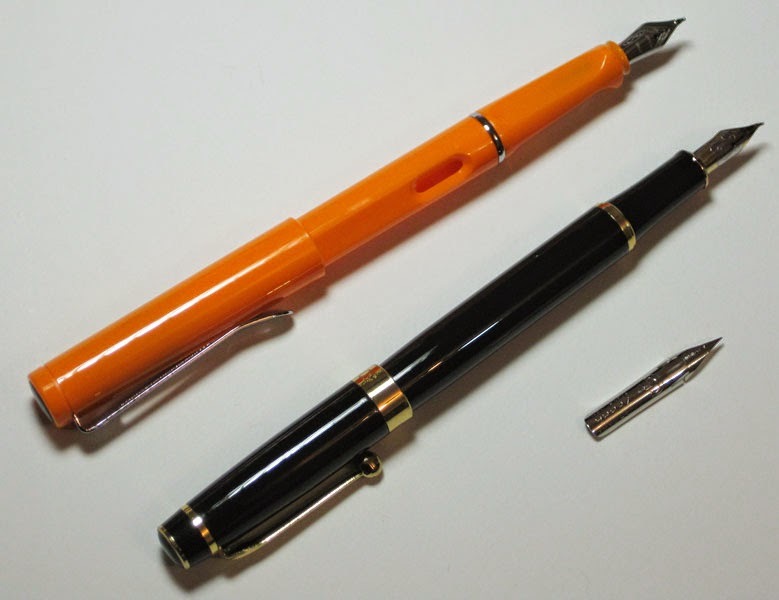 Six bucks for a flexible-nib fountain pen (and nine nibs left over for my friends)? I’m in! Unfortunately, it wasn’t that simple. Although the Jinhao was supposed to be a compatible body for the Zebra G, no amount of finagling on my part would make the two work together. 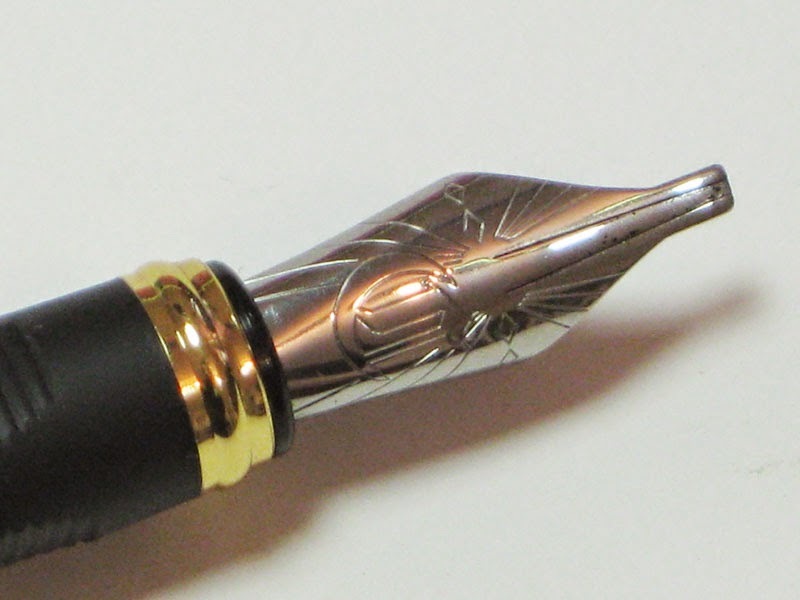 The curve of the nib is tighter than that of the Jinhao’s feed, so although the feed would be full of ink, the contact with the nib wasn’t sufficient to fill the nib. I had the same problem with the Nemosine body that fit the Christoph nib so well. Apparently people have been filing away the sides of the feed and making other modifications to force the Zebra G nib to fit. I could do that too, I suppose, but frankly, I’ve lost interest. When I want a flexible nib, I’m happy with my Pilot Falcon. You can tell that this series is drawing to a close, can’t you? I won’t even make you wait until next week. 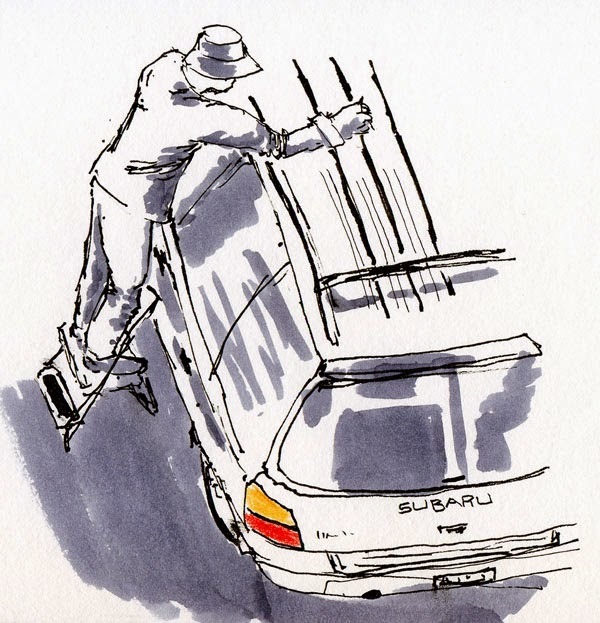 For the past several weeks, Greg has been getting his Subaru Forester ready to sell. Maintenance work is all done. Now he’s down to the fine detailing, and that car is cleaner than it has been since he bought it. This afternoon he was scrubbing the luggage rack on the roof, and I had a clear view from our upper deck. 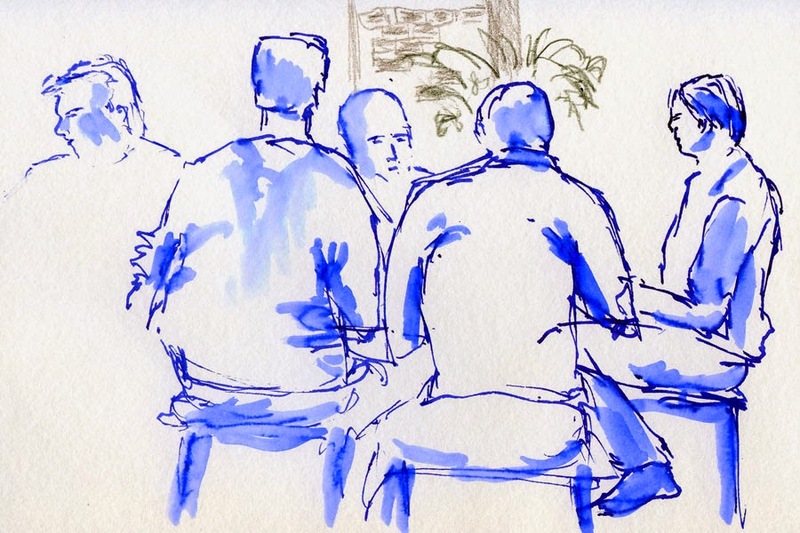 Sketching people who are talking – usually with hand gestures and changing expressions – is more challenging than still-as-stone texters and typers. But the body language is definitely more interesting. Every time I visit the Museum of Flight, I imagine that it will be easier and less overwhelming than the last time, but somehow, that never comes true. 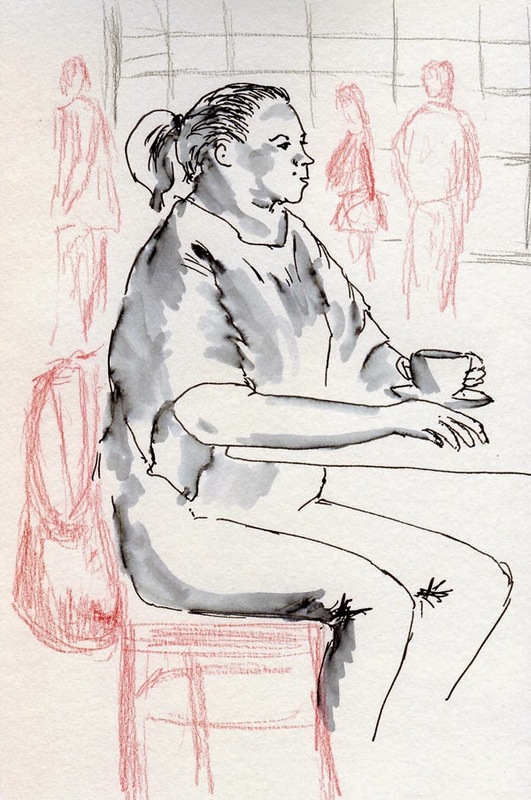 (My very first time was with the Friday Seattle Urban Sketchers more than two years ago.) This morning with the Friday sketchers was no different. 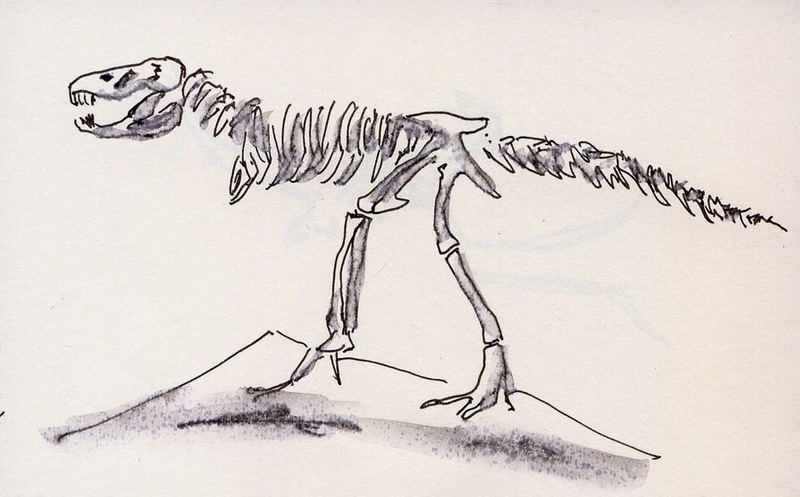 As soon as I walked into the enormous Great Gallery, I wandered around in a daze, trying to simplify the view – any view – enough to sketch it. After quite a while, I caught a glimpse of a Lockheed SR71 Blackbird and a couple of other stealthy-looking fighter planes between the wings of a Boeing 801-A (1929). That one sketch took me more than an hour – much longer than I usually take for any one sketch just because I had to keep talking myself out of putting in more! After that lengthy sketch, I had only a few minutes before the meetup, so I went out to the main entrance area. 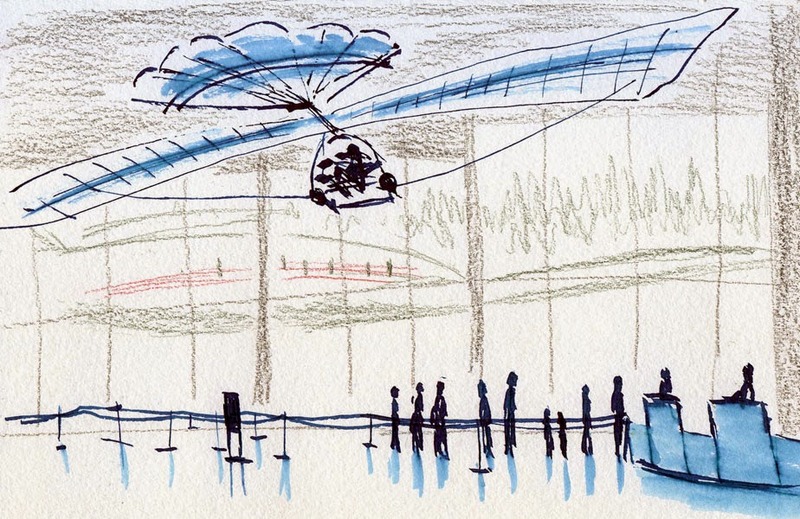 Above the line of people waiting to get in was a reproduction of Leonardo DaVinci’s Il Cigno, a human-powered ornithopter. After sharing sketches and having lunch al fresco, a few of us stayed behind for a little more sketching. 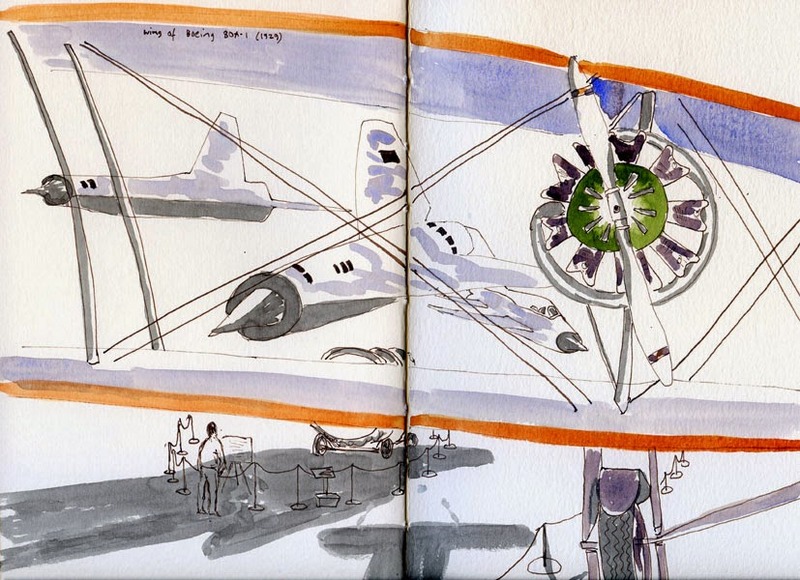 The day had warmed up nicely, so I went back out to the café’s outdoor seating area to sketch Air Force One and a 787 Dreamliner in the Airpark. 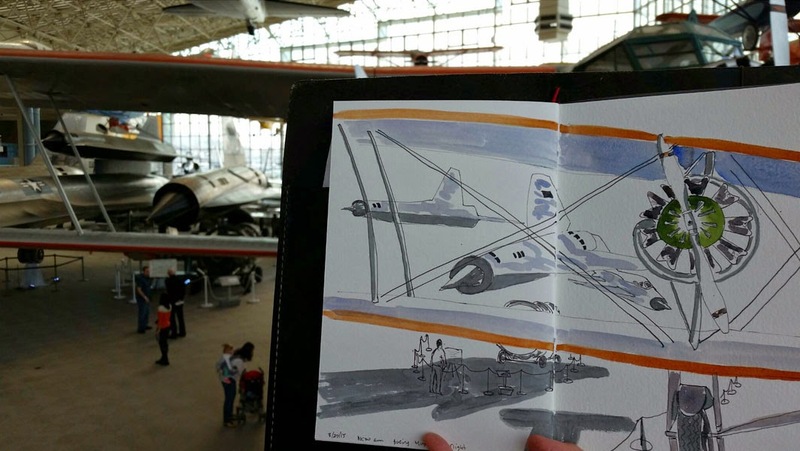 Many thanks to Museum of Flight volunteer Kate Buike for sponsoring today’s USk sketchout! 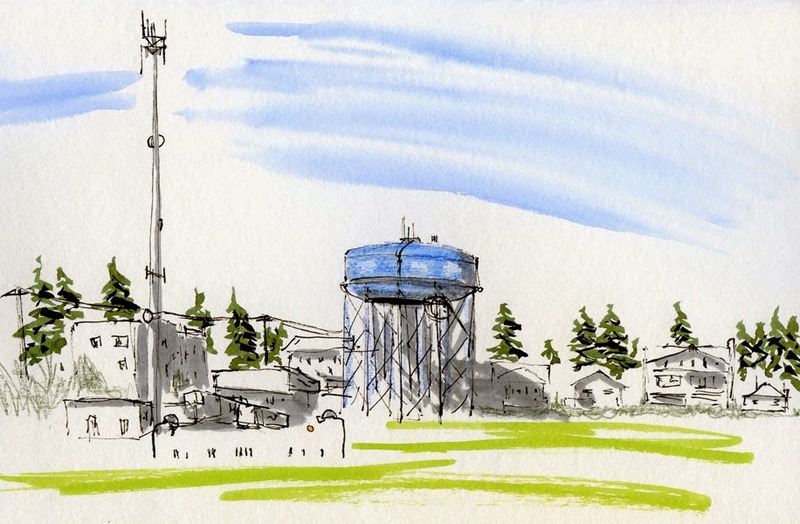 The Maple Leaf water tower has been the subject of my sketches many times. Sometimes I enjoy getting into all the details of the complex, criss-crossed girding and the maple leaf motif going around the tower. Today, under a mostly clear blue sky and 70 (!) degrees, it felt like the best of summer, and my mood was just as lazy. On a shady bench but not too far from the sun, I sat on the opposite side of Maple Leaf Park to take in the long view of the water tower holding its own next to the cell tower. I wanted something a bit more challenging than the oranges and bananas on our kitchen counter. 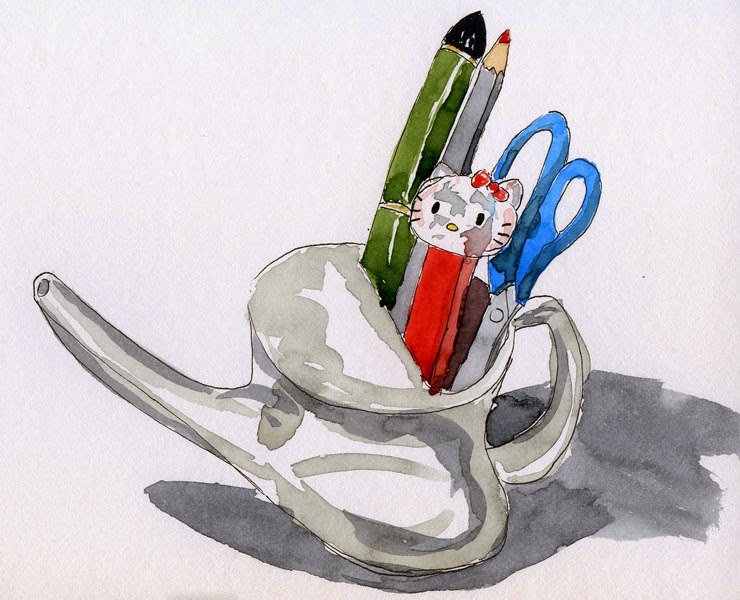 First I grabbed my neti pot, which has a challenging shape, and then I looked around my desk and threw a few colorful items into the pot. But it needed one more thing: the Hello Kitty Pez dispenser filled it out nicely. Little did I know that this particular collection of random stuff was more challenging than I had bargained for. First, the subtle shadows on the neti pot’s white ceramic surface were even more difficult to capture than its shape. Pens and pencils always come out a little crooked when I sketch them. But who knew that Hello Kitty’s transparent head would turn out to be such a bear! Rain is in the forecast for the next two days. It was showering when I left for a meeting, but that had subsided to a sprinkle on my way home. Before I arrived, the sun broke through, so I stopped for a sketch of this tree silhouetted against an ominous sky. 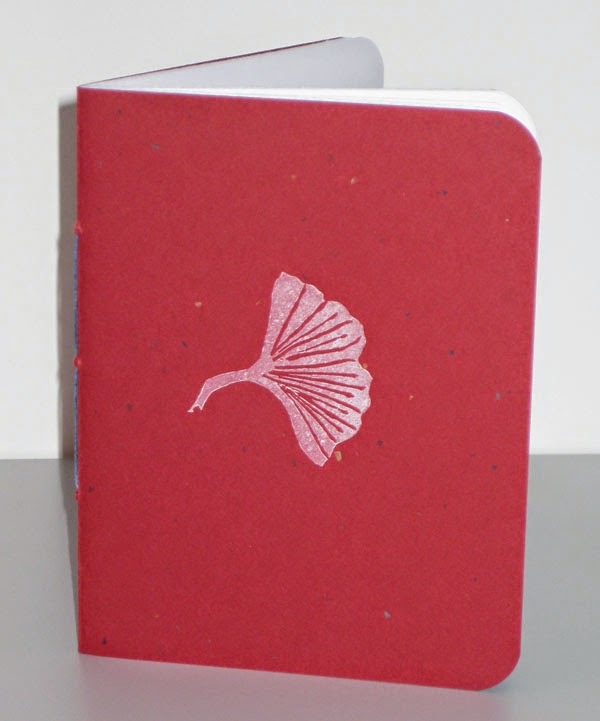 My DIY sketchbooklet, this time filled with Rhodia paper. As I was running out of my stock of DIY sketchbooklets, I started grumbling anew about why even one of the plethora of manufacturers making small, thin pocket-sized notebooks doesn’t offer one that contains blank, fountain pen-friendly paper that could be used for casual sketching as well as writing. A couple of months ago I renewed my search for such a notebook and ended up trying Baron Fig’s Apprentice. The paper is not ideal, but at least it’s blank, and I still have hope that the company’s attitude about responding to customers’ needs might eventually result in a notebook with better paper. Rhodia paper, which I first experienced last summer in my travel journal/sketchbook, is a joy to write and sketch on with a fountain pen. It even holds up to a very light waterbrush wash. The see-through problem, common to all the notebook papers I’ve tried, is still there, as would be expected for 21.3-pound, “high-grade vellum” paper. More notable, though, is that I saw no bleed-through at all, even on spots where I had washed the ink on the other side (see below). And I’m pleased about the number of pages I can bind into a small, thin notebook, giving me more bang for the handbinding buck. An 80-sheet pad of No. 18 (8 ¼ by 11 ¾ inches) Rhodia paper costs about $10 - $12 on Amazon (a little less at the University Bookstore where I bought mine), so that means my notebook cost about 80 cents, including the 100-pound cover and waxed linen binding thread. It took about 20 minutes to make (not counting carving the gingko leaf block, which I made a while back). If I could buy it, I would. But to get what I want, DIY seems to be my destiny. Updated 9/5/15: The closest I have come to finding an ideal store-bought, daily-carry sketchbooklet is the Field Notes Workshop Companion edition. It's a limited edition, so if you want them, buy them before they disappear! The University Bookstore (one of Seattle’s endangered breed of independent booksellers) probably has the largest brick-and-mortar Moleskine collection in the city. Back when I was using Moleskines regularly for journals and planners, it was great to have such a broad selection there. It’s been a long time since I’ve used or cared about anything with the Moleskine name, but I was at the store recently, so I thought I’d take a look. I spotted Moleskine’s relatively new “Art Plus” line, which includes a watercolor sketchbook that Liz Steel and other sketchers have already panned, so I didn’t even look at it. But a pocket-size softcover book called an Art Plus Sketch Album caught my eye. Its paper cover makes it very thin (1/4 inch) and lightweight. I’m not crazy about the landscape format, but it’s not available in the portrait format that I prefer. (I rarely sketch a double spread horizontally, and the format is awkward to hold in either direction when it’s bound on the short side.) Another anomaly is that every page is perforated. (I guess if I particularly liked a sketch or someone else did, I could tear it out easily and frame it or give it away! Not likely.) Though my expectations of its paper were very low, I thought its size and thin profile might have possibilities as an everyday-carry sketchbooklet. bled wherever I touched it with a waterbrush. At least the paper met my expectations. It’s the typical Moleskine ivory color, blank and 81 pound in weight – definitely heavier than the stuff that’s in Moleskine’s traditional (non-art) notebooks and planners, but also much lighter than the weird, manila-folder-like stuff that’s in the classic “sketchbook” (which has been rebranded to be part of the Art Plus line). The smooth surface isn’t bad with a fountain pen – no bleeding or feathering evident. But as soon as I touched it with a waterbrush, the ink sank straight into the paper, leaving strange blotches (see top of page) instead of blurring into a pleasing wash. (The label says, “Ideal for pencils, pastels, charcoal, fountain pens, markers” – nothing about a wash or liquid – so I can’t accuse them of false advertising.) Wherever I put water on the ink, it bled through to the other side (see above). With a Zebra brush pen (sketch at right), which contains waterproof ink, it bled through slightly even without putting water on it (although that degree of bleeding is probably acceptable for the casual sketches I’d be likely to put in this sketchbook). One positive thing I can say is that the paper is sufficiently opaque that there’s very little ghosting (in the image below, I’ve circled a spot where I can barely see the sketch on the next page showing through). 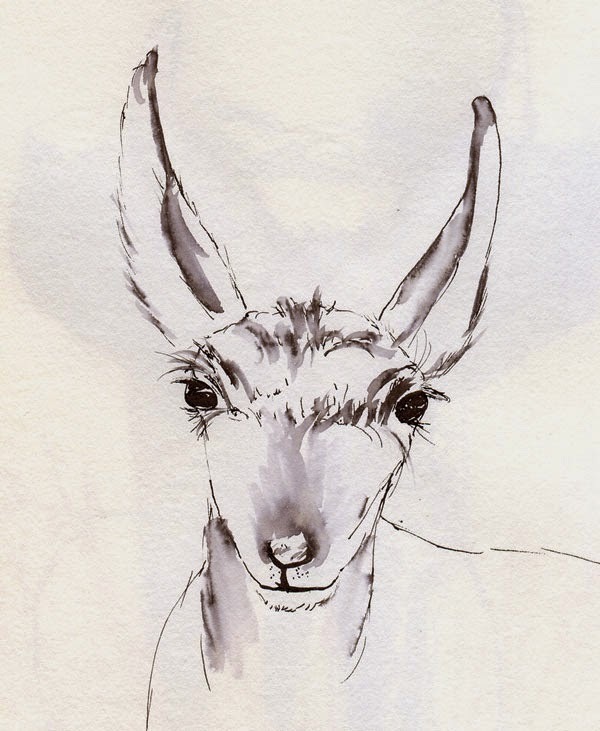 It’s definitely acceptable for drawing on both sides – as long as I use dry media or ink without washing it. If I could simply get over my preference for shading ink drawings with a wash, or if I switch to pencil, this (and many other) pocket notebooks would easily meet my needs. Alas. . . .
ghosting from the sketch on the following page showing through. 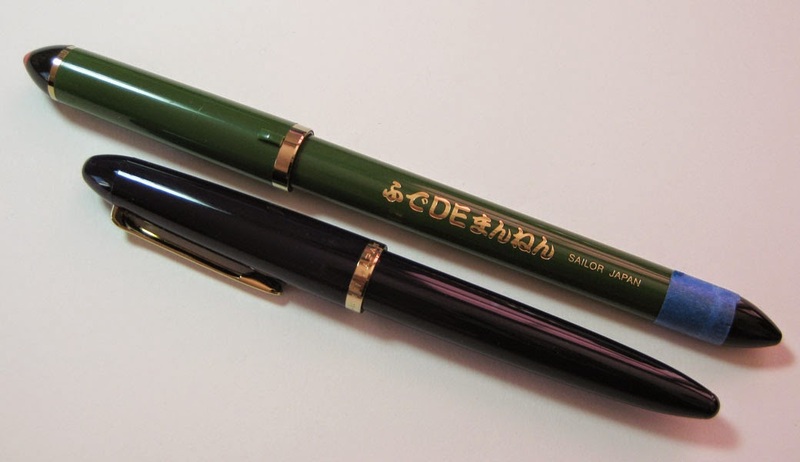 The only experience I’d had with an inexpensive Chinese fountain pen was the Hero 501-1 calligraphy pen, which has a bent nib similar to the Sailor fude. I used it briefly more than a year ago and then rejected it, mainly because it did the same things the Sailor did, but not as well, was much heavier, and dried out quickly when left idle. As a result, during my Epic Search, whenever I’d heard mention of the Jinhao – another inexpensive Chinese brand – I generally dismissed it from consideration. Reviews varied widely – everything from “best-pen-I’ve-ever-used-even-better-than-my-$100-Pilot” to “piece-of-junk-threw-it-immediately-in-the-trash.” Who needs a pen with that kind of inconsistent quality? During a casual reading of the Fountain Pen Network’s Facebook group, I happened upon a thread that mentioned using the Jinhao X450 fountain pen body, which costs a whopping five bucks on Amazon.com, as the base for other nibs. 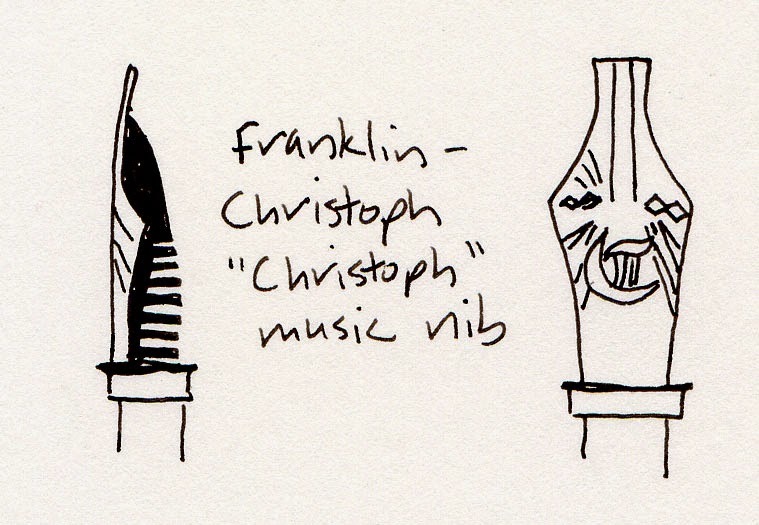 I knew that people were doing this with Goulet’s nibs, but what turned my head was the Franklin-Christoph music nib (also known as the “Christoph”). That music nib, which has been getting rave reviews, could be purchased independently (for $35 from Franklin-Christoph) and put onto a cheap Jinhao body? Suddenly that five-dollar pen was sounding more interesting. I bit. It was my first step into the “Frankenpen” world. Writing samples made with Franklin-Christoph music nib. The mechanics of this particular Frankenpen combo were easy: Pull the nib and feed out of the Jinhao, align the Jinhao’s feed with the F-C music nib, and place both back into the Jinhao’s section collar. (GourmetPens.com has an informative post about this.) To my surprise, they fit perfectly without any tweaking. And to my greater surprise, the combo writes beautifully (considering its Frankenpen origins) – smooth, wet and luscious. All I know is that compared to the Lamy 1.9 stub nib, which I tried briefly last fall, the F-C music nib is much smoother – the Lamy has sharper corners – and keeps up with the ink flow better. It was delightfully responsive when I sketched a pair of evergreens in Shoreline last month (see below), giving me interesting line variation without much effort. 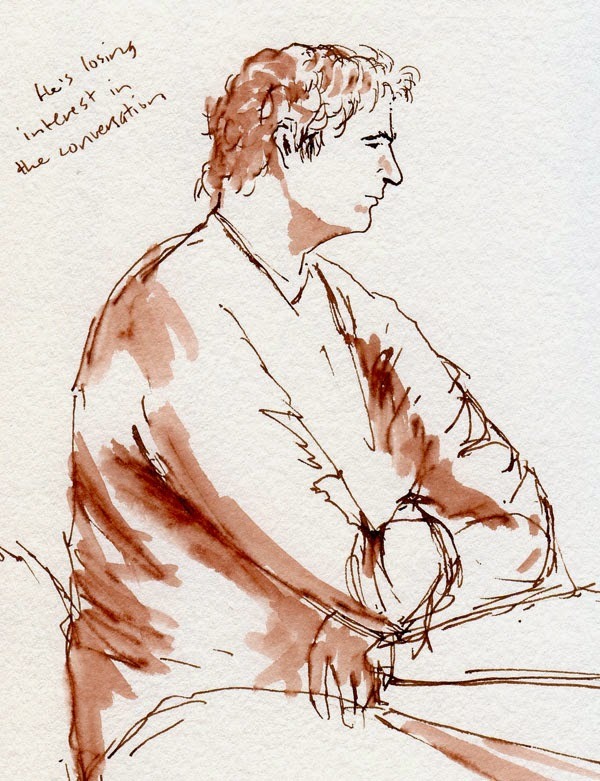 In my very first sketches with the Christoph, I was pleased that by using its thin edge, I could get enough control to sketch facial details in people (see the man below). 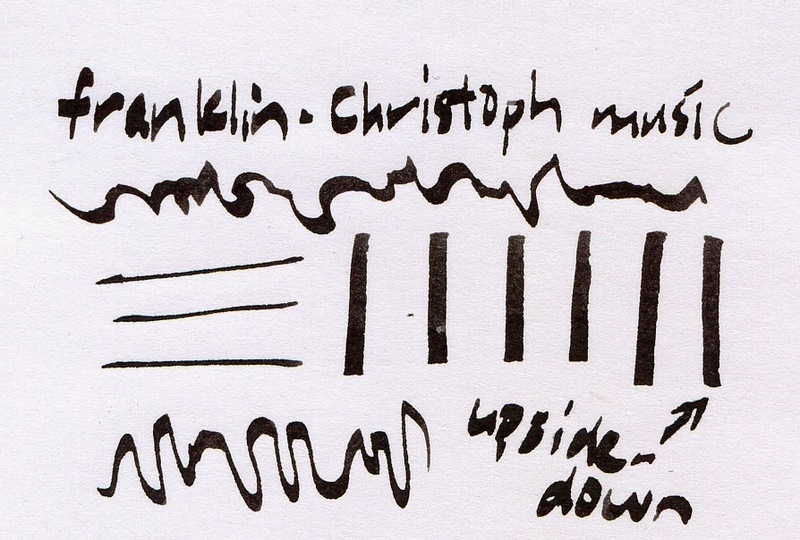 Line-width comparison of three music nibs. You may recall from my review of Platinum’s music nib that I was surprised by how broad it is compared to the Sailor’s (my only previous experience with a music nib). The Christoph is even broader (see the sample at right comparing line strokes from all three) and acts more like a calligraphy stub nib compared to the Platinum, which has a rounder tip. I can write “normally” (whatever that is) with the Platinum, but the F-C nib requires making very large letters (and the writing would certainly be more attractive if I knew how to write in an italic script). In terms of line variation, the F-C nib really has only two: thick on the down stroke and thin on the horizontal stroke. 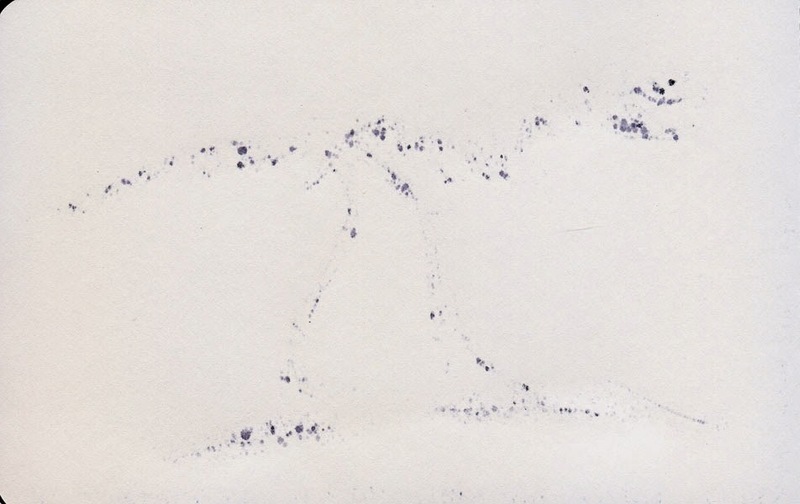 I wasn’t able to get the finest of fine lines for the Arctic fox’s whiskers and fur (at left) as I was with other pens. I don’t think it would serve me as an all-purpose sketching pen, as it has no gradual change from thin to thick as the Sailor fude or zoom nibs do. 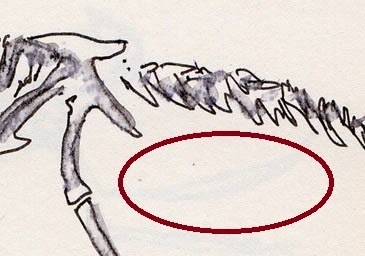 It also has no extra-thin point when reversed as some other nibs do. Still, I have grown very fond of the Christoph’s broad yet easy-to-control line. I think it’s a keeper, if only because I have so much fun sketching fir trees with it. Since this review is focused mainly on the fantastic music nib, I won’t dwell too long on the Jinhao X450 itself, which I chose in the marbly gray-brown “Magic Fog” pattern. I inked up its original nib (size M) briefly, and it is surprisingly flexy and wet. It would probably be a good writer and even a decent sketcher (though it isn’t flexy enough to consider it a variable-line-width nib in the same way that the Pilot Falcon nib is). 2/24/15 Trees sketched with F-C music nib. But I don’t have much good to say about the rest of the pen. Although I like the size and girth, it’s too heavy for that size, especially the cap, which makes the pen feel unbalanced when posted. Even worse, however, is that the cap doesn’t post securely (a huge pet peeve of mine!). For some, the solution would be to simply use the pen unposted, which would probably improve its overall balance. But the only time I’d be using that pen is sketching on location, and if I can’t post the cap, I’ll probably lose it. (In fact, the first time I used it in the field, the cap fell off, hit the pavement and chipped.) An unpostable pen is a deal breaker for me. The solution? I got a Nemosine Limited, another reasonably priced pen compatible with the Christoph nib. 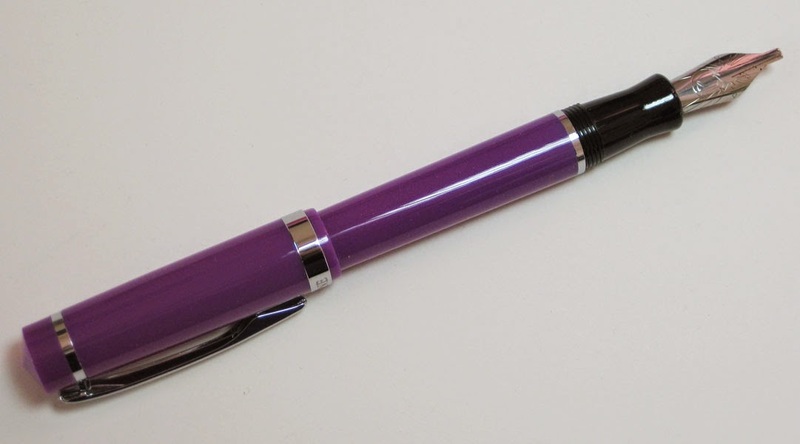 Indeed, not only does it accommodate the nib as easily as the Jinhao did – it is also lightweight, its cap posts perfectly, and it comes in purple! Alas, it was too good to be true. The Nemosine’s feed apparently doesn’t fit exactly right with the nib, because the pen leaks profusely sometimes and goes dry at other times. It’s infuriating. At this point, I don’t recommend either of these pen bodies (at least to pair with a Franklin-Christoph nib), and I’m beginning to regret that I didn’t simply spring for a Franklin-Christoph body initially, which would certainly support the F-C nib. But the lowest-priced F-C Model 27 Collegia is $69.50 – just a tad more than the five bucks I spent on the Jinhao or the $18 I paid for the Nemosine. There must be other pens that are compatible with No. 6 nibs. I’m going to keep looking. 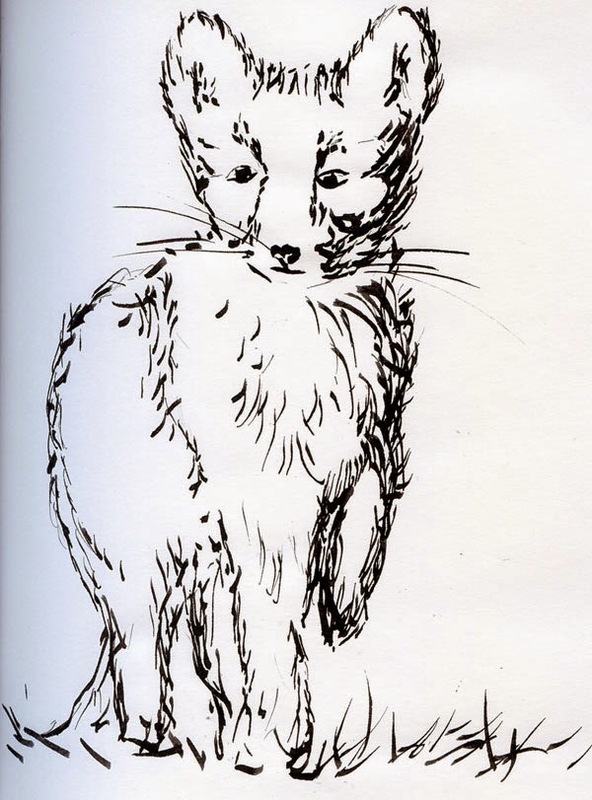 Updated 3/24/15: I tried the Christoph nib on another Jinhao X450 – exact same model, just a different color – and the cap on this one posts securely. It’s just as heavy as the first, but as long as the cap posts, I can tolerate it. I guess the trick with these inexpensive pens is to try several, and they are made with such low quality control, that your chances are just as good of finding a good one as they are of finding a bad one. Franklin-Christoph music nib on Jinhao X450 body. Franklin-Christoph "Christoph" music nib on Nemosine Limited body. My noodles came too fast. After ordering a bowl of miso ramen at Samurai Noodle, I figured I’d have plenty of time to sketch the large party of men who sat down at the table in front of me. But the service was way too fast. Finish my sketch? Or slurp down a huge bowl of steaming hot ramen? End of sketch. Rain was predicted all day. I’d planned to leave my car for servicing in the U-District and then look around at the Henry Art Gallery while I waited. As I walked to the gallery, though, the rain hadn’t yet started. 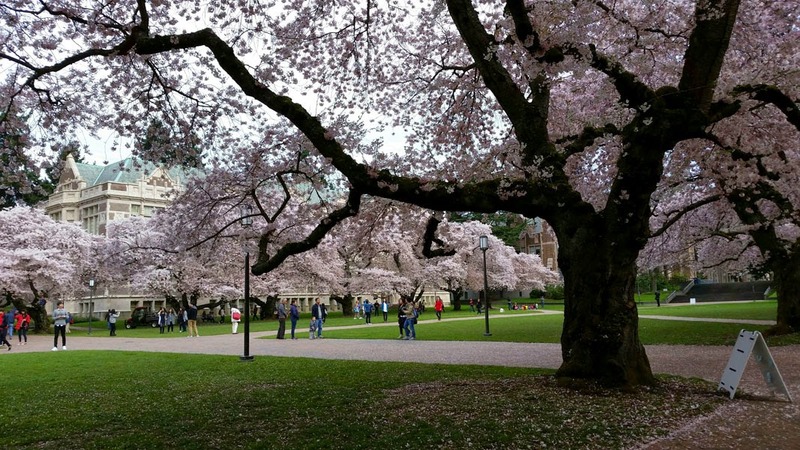 I made a quick change of plans: the Quad’s cherry trees! In full bloom, the Quad on the University of Washington campus makes you feel like you’re walking under a field of clouds made of huge fluffy blossoms. 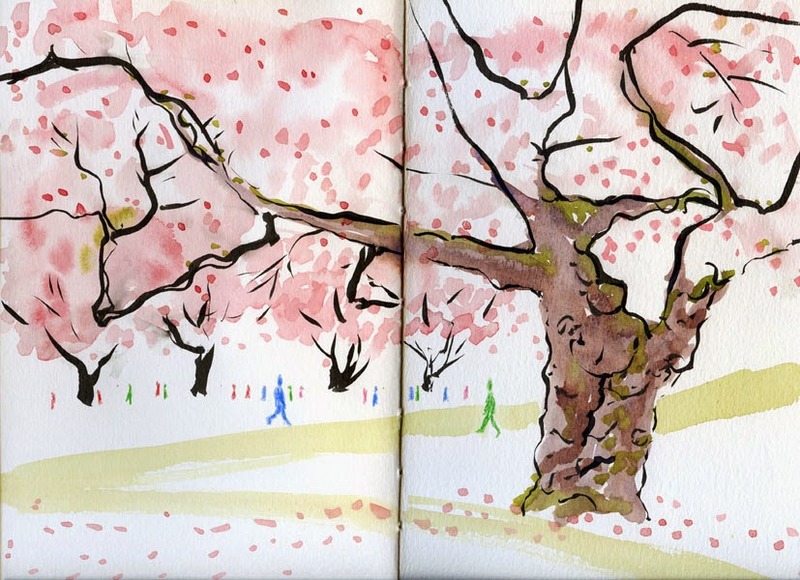 Two years ago when a freaky warm Saturday brought out crowds of hundreds to see the cherries, I remember wearing flip-flops as I sketched. 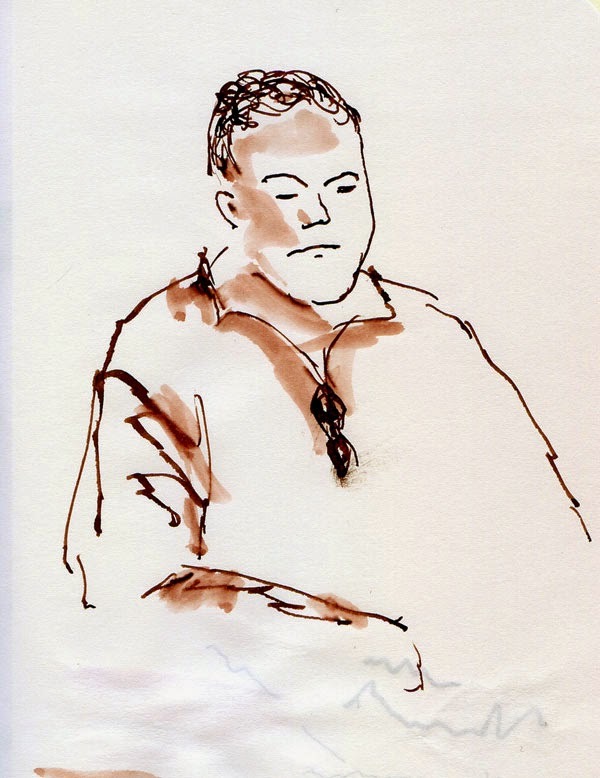 Last year it was much colder – I shivered through my sketch and dashed through hail back to the car. This year I noticed something new: Signs asking visitors to help protect the venerable old trees by refraining from climbing them and shaking their branches. Moss covers their huge, knotty trunks. Today the sky was overcast, but the temperature was mild. Pale pink petals snowed all around me. 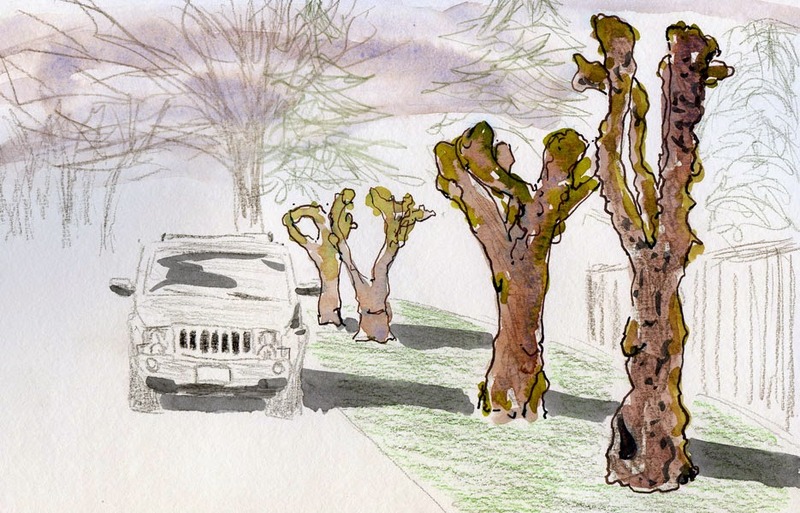 Eventually it did begin to rain, but not before I finished my sketch on this first day of spring. Since an errand had brought me to the Capitol Hill neighborhood this afternoon, my intention afterwards was to head for Lake View Cemetery, where some large cherry trees stand. But on my way, I was stopped short by a whole block of trees that looked like this – cut off into multi-pronged stumps and covered with moss. I’ve occasionally seen trees like this in other areas, though usually not so many together. But Capitol Hill is home to some of Seattle’s oldest trees, so it’s not surprising to find some that have suffered disease. Whatever befell them, they are now a thriving habitat for moss, so it’s nice that they weren’t cut down all the way. By the time I got to the cemetery, the clouds had turned dark and foreboding, and sure enough, it began to rain. 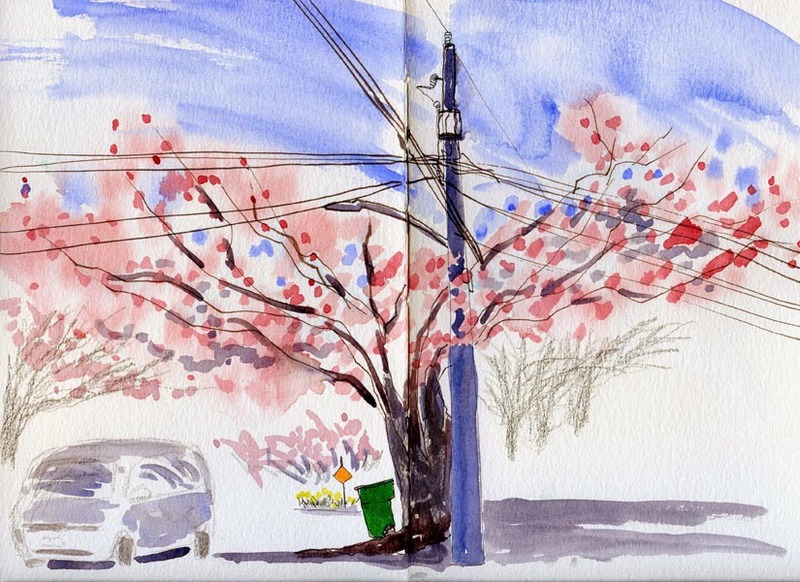 After sketching the cherries on Sunset Hill, I still had one more place I wanted to catch before the wind and rain blew the blossoms away – Dibble Avenue Northwest in the Greenwood neighborhood. About a block and a half of that street is illuminated with pale pink trees. Much younger than the ones on Sunset Hill, these trees have trunks that aren’t nearly as stout, but the branches are fuller, spreading all the way across the street. The morning looked like rain, but by afternoon, the sun came out, and I knew it might be my only opportunity. I bundled up in two layers of Polartec and took the top down as I drove to Dibble. Most of the trees there had dodged utility wire butchering, but then I found this one, still glorious in its fleeting beauty. When I returned to my car, the seats and floor were covered with petals from the trees I had parked under. Fleeting, indeed.